November 27, 2017  According to Politico, President Trump is considering an appointment to the Census Bureau that some watchers suggest might be open to changing the 2020 Census in a dramatic way. November 21, 2017  CBS suspended Charlie Rose after several women told The Washington Post of sexual harassment by the TV host. And, the Justice Department filed a lawsuit to block the merger of AT&T and Time Warner. November 20, 2017  Three Alabama newspapers urged voters not to elect GOP Senate candidate Roy Moore, who's accused of sexual misconduct. In Kenya, judges dismissed a pair of petitions challenging the Oct. 26 vote. November 17, 2017  Chandler, who died in 1959, wrote detective fiction set in mid-20th century Los Angeles. A magazine editor recently discovered a never-published Chandler story that had gone missing some 60 years ago. November 16, 2017  A woman has come forward with an account of alleged sexual assault by Sen. Al Franken, D-Minn., in 2006. Franken is not denying the incident and apologized to the woman in a statement. November 16, 2017  House Republicans hope to vote Thursday on their tax overhaul legislation. The Senate's measure is working its way through committee. And, Alabama Senate candidate Roy Moore faces new allegations. November 11, 2017  MoBike, China's first bike-share company, is worth $3 billion. 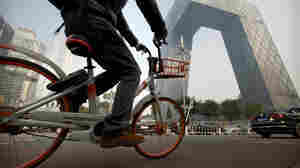 "I personally like riding bicycles," says the company's 35-year-old president Hu Weiwei. "I was thinking, 'How can I bring bikes back?'" November 10, 2017  A bikeshare start-up in Beijing is set on getting China's commuters out of their cars and on two wheels. But even with 7 million bikes in cities in China and the U.S., Mobike has yet to show a profit. November 9, 2017  In Shanxi Province, coal is big business and a source of identity. Now China is closing and consolidating its coal mines under state ownership, and the region has not figured out how to rebound. November 9, 2017  Hundreds of thousands of Chinese come to the U.S. to study and work. Those who return to China are nicknamed sea turtles. We hear from a returnee to China who's trying to adjust to life in Beijing. November 8, 2017  Democrats have won key races for governor in Virginia and New Jersey. Also, more details are emerging about the Texas shooter's past in the Air Force. November 8, 2017  In China's Shanxi province, farmers grew very rich prospecting for coal. 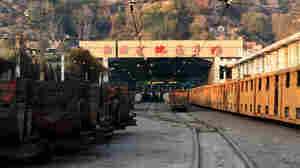 Now, China has consolidated the mines and is aggressively cutting back production, for environmental reasons.